Image caption The British Museum says its display of the Marbles "highlights their significance within world culture"
The prime minister has been criticised after he opposed calls to return the Parthenon Marbles to Greece and the Koh-i-Noor diamond to India. Mr Cameron was asked if he supported returning the diamond on 21 February when visiting Amritsar in India. He replied: "I don't think that is the right approach. It's the same question with the Elgin Marbles and all these other things." But campaigners for the Marbles' return say the two cases are quite different. Mr Cameron said: "I think the right answer is for the British Museum and other cultural institutions in Britain is to do exactly what they do, which is link up with museums all over the world... to make sure that the things that we have and look after so well are properly shared with people around the world. "No, I certainly don't believe in 'returnism', as it were. I don't think that is sensible." Friezes and pediment figures which decorated the Parthenon temple in Athens, built 447-432 BC. Many were removed by agents of the British diplomat Lord Elgin in the early 19th Century, and eventually sold to the British Museum. Most of the surviving sculptures are roughly equally divided between London and Athens. 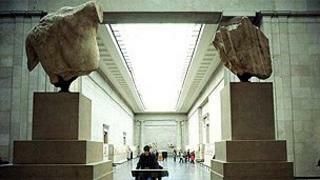 Greece has repeatedly demanded that the British Museum marbles be returned to Athens. The British Committee for the Reunification of the Parthenon Marbles, formed in 1983, supports the Greek demand. Athens' new Acropolis Museum opened in 2009. It is designed to display all the surviving sculptures, in their original layout. This echoes the oft-stated argument of the British Museum, where the sculptures made in Athens in the 5th century BC have been kept since 1816, against their return to Greece. The museum says the sculptures are a vital element in its displays, which it says are a "unique resource for the world" allowing visitors to "explore the complex network of interconnected human cultures". A British Museum spokeswoman told the BBC the Marbles and the 105-carat diamond - which was ceded to Britain under a treaty in 1849 and is part of the Crown Jewels - are "very different objects that have been acquired in very different ways". But the idea of seeing that the Museum's collections were made available to the world was "very much our remit," she agreed - "trying to preserve the collection and make it as accessible as possible". However, Eddie O'Hara, chairman of the British Committee for the Reunification of the Parthenon Marbles (BCRPM), said calls for the return of the Marbles were "probably unique... the reunification of the integral sculptured components of a Unesco world heritage monument, acquired in circumstances that were at best dubious, in an act of cultural vandalism." The sculptures were acquired by the British envoy Lord Elgin in the early 19th Century under a permit from Greece's Turkish rulers which is contested by many observers. The Greek government, the BCRPM and other supporters of their return say they should be reunited with other sculptures from the temple which have always remained in Athens. Former Labour MP Mr O'Hara also criticised Mr Cameron for calling them the "Elgin" Marbles - a term the British Museum no longer generally uses. "The fact that he conjoined two such widely differing cases as the Koh-i-Noor diamond and the Parthenon Marbles, and the fact that he called the latter the 'Elgin' Marbles suggests that he does not appreciate what a simplistic and inadequate concept 'returnism' is," said Mr O'Hara. The Koh-i-Noor diamond fell into British hands as part of the Treaty of Lahore, which saw Britain take control of Punjab. It was last worn by the late Queen Mother and was displayed on top of her crown when her coffin lay in state after her death in 2002. Numerous Indian politicians have called or its return.